There are three types of insolvency in England for people whose debts are impossible to manage: bankruptcy, IVAs and Debt Relief Orders (DROs). Everyone has heard of bankruptcy and IVAs are widely advertised – if you have ever had a call call or text offering “a little known government scheme to write off 70% of your debts”, that was from a commercial firm trying to sell you an IVA. DROs are much less well known. Introduced in 2009, they are the simplest, quickest and cheapest form of insolvency – so if you have major financial problems find out if a DRO might suit you. you have to have less than £50 a month available to pay towards your debts. If your only income comes from benefits, you will automatically meet this. A DRO lasts for a year. During this time you don’t have to make any payments towards your debts and your creditors are not allowed to hassle you or take you to court. At the end of the year, your debts are wiped out. If you would like to know more about how DROs work and what the criteria are, there is a guide here. DROs are a good debt solution for people who meet the criteria and whose situation isn’t likely to improve soon.The DRO fee is only £90, much less than bankruptcy. And it is over in a year, unlike an IVA where you have to make monthly payments for five years. If you have just lost your job and are struggling, but will be fine when you find another job, then a DRO isn’t a good idea. A token payment debt management plan would be a better temporary solution, to give you a breathing space. Citizens Advice is the largest organiser of Debt Relief Orders in the country. We have several advisers in Merton and in Lambeth that can help you look at a DRO, decide if you meet all the criteria and set one up for you – and also talk through what your other possible debt solutions might be if a DRO isn’t right for you. My name is Kirsty Stone, I am a Pension Wise Caseworker based at Citizens Advice Merton and Lambeth. During a recent interview with the Treasury for a promotional video, I was asked whether I have had any Pension Wise clients who were particularly memorable. I instantly thought about one client. Like most people approaching retirement, my client had been sent 50 pages of information, options and leaflets, none of which were particularly helpful to him. Amongst the mass of paperwork was a current valuation which had been broken down into 2 investments of a very similar value. Understandably, my client thought these 2 figures referred to the value of the same pot of money but on different dates. But they didn’t! As a result, I had the pleasure of informing him that he was better off than he had originally thought. This client is not alone in his confusion and his experience highlights the need for pension providers to make their products and paperwork easier to understand. Individuals who come to see us have worked and saved money for their retirement but, unfortunately, are now left with what can feel like an incredibly daunting and intimidating decision – this does not need to be the case. The aim is that at the end of every Pension Wise session each client will be empowered and have the confidence to make the best decision for them as they contemplate retirement. However, this will remain difficult where pension providers are not simplifying their language and paperwork. 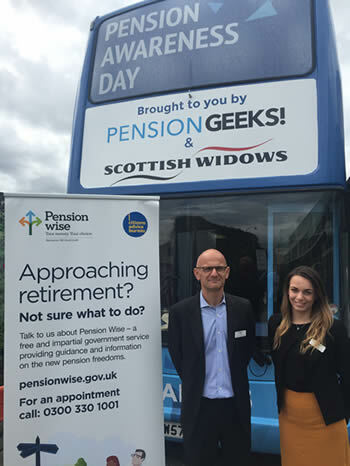 It is therefore down to each Pension Wise Guider to make certain every individual who attends a Pension Wise session leaves feeling able to ask the right questions of their pension provider and doesn’t feel pressured into taking a certain action simply because pensions can be difficult to understand. The pension freedoms available since April provide much more flexibility and potential for anyone with a defined contribution pension and it is vital that people take the time for an impartial, unbiased Pension Wise session, in order to make sure they get the most out of their retirement. Although, unfortunately, we cannot guarantee that we can double every client’s pension! If you are over 50 and have defined contribution pension – also known is a “money purchase” pension – call us on 0300 330 1001 and we can arrange a Pension Wise appointment, which could be either over the phone or face-to-face.